Korea’s rare 14th century Buddhist painting “Water-Moon Avalokiteshvara” returned home from Japan in October. Behind the return was Yoon Dong-han, chairman of Kolmar Korea, one of the leading cosmetics and pharmaceutical companies in the country. 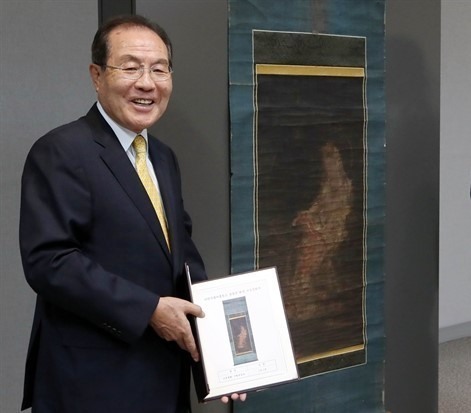 Yoon donated the painting to the National Museum of Korea on Oct. 17 after buying it for 2.5 billion won ($2.2 million) from a Japanese dealer in spring this year. With less than 50 paintings from the Goryeo kingdom “Water-Moon Avalokiteshvara” in existence today, the donation made headlines in the media. Yoon Dong-han, chairman of Kolmar Korea, poses for the camera at a donation ceremony on Oct. 17, 2015. Among the 50 paintings, 46 “Water-Moon Avalokiteshvara” pieces are in Korea, and all of those have been exhibited at private museums -- AmorePacific Museum of Art, Horim Museum, Woohak Cultural Foundation and Leeum, Samsung Museum of Art. The remaining can be found across the globe. Yoon is an entrepreneur who, after training at Daewoong Pharmaceuticals for 15 years, set up Kolmar Korea in 1990. Kolmar Korea is the nation’s No.1 original development manufacturing cosmetics and pharmaceutical company. It joined the exclusive business group for sales, the “1 trillion won club,” in 2015. The company is now aiming to expand business in the US and China. According to The Superrich Team’s analysis, Yoon is the country’s 92nd richest businessman as of Nov. 9, with 252.8 billion won of stock assets. Yoon gained a diploma in business at Yeungnam University in North Gyeongsang Province. He started his career at state-run agricultural cooperative Nonghyup, then moved to Daewoong Pharmaceuticals. In collaboration with Kolmar Japan, he set up Kolmar Korea in 1990. Kolmar Korea was the first in the nation’s cosmetics industry to adopt the ODM system in 1993. The fast growing company entered drug making in 2002, then health food manufacturing in 2004. It supplies cosmetics products to more than 500 brands, including Estee Lauder and AmorePacific. In October 2012, Kolmar Korea set up Kolmar Korea Holdings to dominate the subsidiaries. Chairman Yoon and his family stand on the top of company structure as they handle Kolmar Korea Holdings. Kolmar Korea Holdings dominates two listed companies and 13 unlisted units. Under Kolmar Korea Holdings, Kolmar Korea and Kolmar BNH Inc. oversee HNG, Sun&One Cosmetics Inc., Geuno Farming and more. Kolmar Korea Holdings owns 56.2 percent of shares in Kolmar BNH, 77.94 percent of stake in C&I Development, and 77.1 percent of stake in Kolmar Pharma. The ownership family owns 49.18 percent of shares in Kolmar Korea Holdings. Yoon Dong-han owns 40.3 percent of shares in Kolmar Korea Holdings. His son Sang-hyun, president of Kolmar Korea Holdings, owns 8.67 percent. The chairman’s daughter Yeo-won, executive director of the holdings company, owns 0.06 percent of shares. The chairman’s wife Kim Sung-ae also holds 0.15 percent of shares. Kolmar Korea Holdings owns 21.67 percent of shares in Korea Kolmar Co.
Yoon Sang-hyun earned a bachelor’s degree at Seoul National University in 1999, then extended his study at Stanford University. After getting a master’s degree in business there, he worked for Bain & Company -- a “training school for Chaebol scions.” He soon returned to the family business as planning director of Kolmar Korea in 2009. The junior Yoon recently took a lead in the business following Kolmar Korea’s foray into global market. Last month, Kolmar Korea acquired Process Technologies and Packaging LLC, to increase competitiveness of color cosmetics products. PTP is a Pennsylvania-based ODM cosmetics manufacturer in particular known for its quality color cosmetics products.